Can Your Irrigation System Actually Conserve Water? Go Back to the Homepage / Can Your Irrigation System Actually Conserve Water? If you read our post about our responsibility to the total, than you know that Total Sprinkler and Lighting has a strong commitment to the environment and its resources. The use of those resources is involved in two major areas of our business: irrigation sprinkler systems and landscape lighting. In this post, we’ll discuss the benefits and drawbacks of installing and maintaining an automatic irrigation system. Where we present potential downsides to these systems, we’ll also include realistic solutions that ultimately make having an irrigation system beneficial. The pros are pretty straightforward with a sprinkler system. They provide direct access to unlimited water (we use this term very loosely and with the idea that water conservation is a main function of the design), act almost entirely on their own with very little human effort, and ensure the landscaped environment receives adequate water coverage year round. 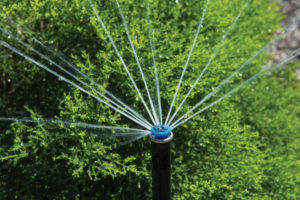 Automatic systems are fitted with rain sensors to override watering cycles (as required by Florida state law), saving water during the rainy season. When installed properly and with high-grade commercial parts, their lifespan easily makes them more durable than antiquated hose and head setups. Irrigation systems are installed using PVC piping laid underground in a grid and connected using a strong, water-phobic glue. Currently, this is the only method of installation. PVC, or polyvinyl chloride, is a mass produced plastic and one of the most widely used – from food packaging to toys to buildings. It is durable, weather resistant, and can withstand the high pressures of an irrigation system. Unfortunately, it is the most toxic of plastics with little possibility of being recycled. Total Sprinkler and Lighting is working with leaders in our industry to find alternative solutions and recycling possibilities. In the meantime, we limit our use to only what is necessary. This means repair instead of replacement and re-use where possible and approved. Over-watering is a major concern with any automatic system. To limit this, each new system includes a rain sensor to monitor weather conditions and adjust to wet seasons. 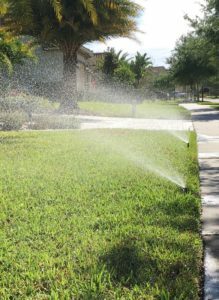 System controllers are set to adhere to mandatory watering restrictions in accordance with Florida’s conservation practices. In addition, we always recommend installing Hunter’s MP Rotator nozzles. These were specifically designed for low pressure systems but have the advantage of efficiently watering at a slower and lower rate to allow the ground to absorb the water, ultimately reducing water waste and runoff. Plus, they look damn good. Click here to view a video of these nozzles in action and see how they compare to conventional units. Finally, to take this thing full circle, careful design of the irrigation system is what will make it stand out as an ecological benefit instead of an environmental leach. Consideration for each component – from glue to distance between sprinklers to type of nozzles used – will have the greatest impact. We stand as a leader in our industry to ensure that each system we service meets our standard for environmental concern.